Lake Louise Ski Resort is like People Magazine’s most beautiful in the perennial poll. This stunning ski area is bold and beautiful with 4,200-acres, a 3,250’ vertical with miles of backside bowl terrain, and the best Canadian Rocky Mountain scenery anywhere. Families will love how incredibly scenic Lake Louise Ski Resort is, and there is plenty of terrain for everyone – from Front Side groomers to the big Back Bowls that remind us of Vail, Colorado. 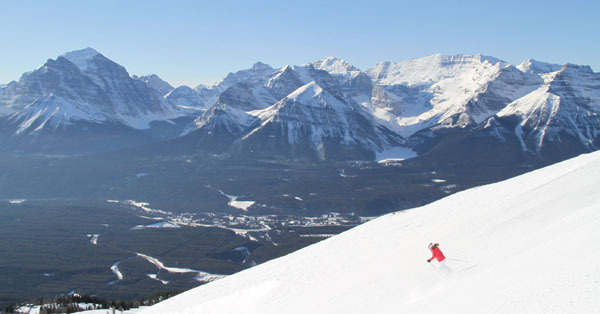 Four mountain faces keep everyone entertained from racers wanting to charge Lake Louise’s World Cup downhill course, to freeskiers seeking the bountiful backside with expert ungroomed steeps, chutes and snowfields of Whitehorm and Powder bowls to name just a few. Lake Louise’s terrain parks are beefy too – located on the Front side with great viewing from the Grizzly Gondola, The Kokanee Beer Kabin, and the Lodge of The Ten Peaks. The gracious Grizzly gondola flanks the front side, along with The Glacier Express Quad and Top of the World six pack lift, while the only ride to the true summit is a 1345’ vertical poma (snowboarders be warned) to th e serious steeps off 8,765’ Whitehorm summit. Once you drop over the backside, mostly advanced and expert terrain with one easy groomed route, be sure to visit the original on mountain lodge, Temple Lodge, for fine fare and authentic alpine ambiance. From Lake Louise’ Back Bowls, you can continue on to more remote terrain, glades and groomers, on Larch served by another quad, or take the Ptarmigan lift returning to the Front side. 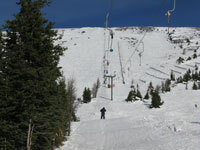 Lake Louise is a big, multi faced mountain so make plans on where and when to meet your family. The Lodge of the Ten Peaks is a grand post and beam lodge at the base in which to boot up, built of nati ve timbers heli-harvest from the resort’s own Ptarmigan glades. Daycare and Skier Services are next door. So start and end your day at Ten Peaks, parents can head to the Powder Keg while the kids hit the tubing hill in sight from the après ski bar. For a super scenic ski in ski out lunch, go to the Whitehorn Lodge, dine on Bison Burgers or Swiss cheese fondue with extraordinary views before heading back out to ski more of Lake Louise’s front side cruisers and back bowls. Lake Louise has a policy, “If you can see it, you can ski it”, according to owner Charlie Locke who bought back his resort in 2008 from RCR, Resorts of the Canadian Rockies that owns Kicking Horse, Kimberley, Fernie, Nakiska, Mont Sainte Anne and Stoneham. The Post Hotel in Lake Louise Village is another gracious ski chalet for lodging during your Lake Louise ski trip. The Post is just as posh at the Chateau, but a bit more private and exclusive without tours tromping through the lobby. The Post Hotel dining, the spa, the suites with fireplaces, and the ice skating rink are all just lovely and from here you are just 2-miles to Lake Louise’s ski slopes. Take the kids dog sledding with Kingmik near Lake Louise, enjoy the rush of being pulled by 10 eager sled dogs along a snow covered forest trail, snuggled in your down sleeping bag equipped sled. Before and after the sled ride, meet and pet the hard working, happy dogs. 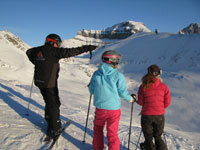 A ski trip to Banff Lake Louise with your family will create a Lake Louise Ski Areamountain of memories.